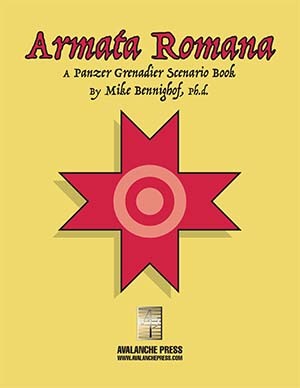 Armata Romana is a scenario book for Panzer Grenadier: Fire in the Steppe (and only Fire in the Steppe). It has the 98 Romanian pieces that once were included in Eastern Front, and twenty scenarios organized into three “battle games” that tie them together with over-arching victory conditions. The scenarios are all revised versions of some that appeared in the old Eastern Front, re-worked by series developer Matt Ward to bring them up to our current standard (Eastern Front had 24 Romanian-themed scenarios; we dropped four of them and re-did the best). Eastern Front didn’t really have a Romanian section; we organized the scenarios strictly by date, so one from the Black Sea coast might follow another that took place in the sub-Arctic. That didn’t satisfy me; that game had a very good series of scenarios based on the Volokolamsk battles outside Moscow and the semi-mythical stand of Panfilov’s 28 Guardsmen that really deserved much better treatment. That dissatisfaction was the root of the story-arc format we use now, which in turn led to the battle game concept. Panzer Grenadier has become an enormously better game series with those features. Once separated from the other theaters, the Romanian scenarios hang together very well. They had been among my favorites in the old game, and when grouped together it’s more obvious that our marketing manager at the time was right – they should have been in their own separate book from the start. The scenarios fall naturally into three segments. The first chapter has seven scenarios, all from the Romanian invasion of Bessarabia in the war’s first weeks. Bessarabia (roughly equivalent to the modern Republic of Moldova) had been a Romanian province between 1918 and 1940, and the Royal Army saw the operation as a liberation mission. The Romanians fought well, with their high morale outweighing shortcomings in weaponry (chiefly, their weak artillery), training and organization. In the second chapter, with six scenarios, the Royal Army pushes the Soviet 9th Army out of Bessarabia and back into southern Ukraine, the region that will eventually be administered by Romania as the new province of Transnistria. Morale remains high, but some of the strains of mobile war are becoming evident. The Romanian cavalry makes itself felt here, yet it’s not a truly modern force. Finally, the Royal Romanian Army sets out on its via dolorosa, the Siege of Odessa, in seven more scenarios. Initially the troops are still willing, but the lightweight Romanian guns can make little impression on the Soviet defenses and it’s up to the infantry to fight their way forward in brutal close-quarters assaults. It’s a sharp contrast to the tank battles seen in Fire in the Steppe, but the game system handles the actions very well. The Royal Romanian Army is very different than either the German Wehrmacht or the Red Army. The infantry is more obviously its backbone (that’s true for the others as well, but they have armored divisions and other elite formations that grab all the headlines and most of the scenarios), but it does have very good elites of its own in the cavalry and mountain divisions (at this stage of the war, still styled as “brigades”). Armata Romana displays the weaknesses of the Armata Romana: the new, modern and mobile artillery batteries are as good as anything the Germans or Soviets can field, but they can’t be everywhere at once. The backward Romanian educational system did not produce enough young men with the background to become successful junior and non-commissioned officers; in these campaigns this lack is less evident, as the Royal Army’s peacetime structure is mostly filled by military academy graduates in the lower-officer slots and long-service professionals in the NCO ranks. The close combat seen at Odessa inflicted massive casualties on these men, and the Royal Army never recovered. For similar reasons, the technical branches, like engineering and communications, were very weak and poorly-equipped besides. On top of that, Romanian organization, based on French models, had little tactical and operational flexibility. In game terms, Romanian units generally have fewer leaders than equivalent German formations, and less obviously the “bell curve” of leader distribution is flatter – it’s harder to set up “chain activations” of Romanian units. Romanian initiative, a measure of the higher headquarters’ planning for a given operation (among other factors), is generally lower. Air support is harder to come by, and often artillery support is limited to lightweight “French 75” field guns. So even when the troops are willing (meaning that morale is good), effectiveness is limited.